The White House on Wednesday issued a statement on President Donald Trump and First Lady Melania Trump's personal donation to relief efforts for Hurricane Harvey victims, detailing which organizations will receive money. The president and first lady are donating a total of $1 million to 12 organizations. The couple had asked members of the White House Press Corps for a list of charities to potentially donate to after Harvey struck parts of Texas and Louisiana. The Trumps are donating $300,000 each to the Red Cross and Salvation Army, and $100,000 each to Reach Out America and Samaritan's Purse. They will give $25,000 each to: Catholic Charities, the ASPCA, Direct Relief, Habitat for Humanity, the Houston Humane Society, Operation Blessing, Portlight Inclusive Disaster Strategies, and Team Rubicon. 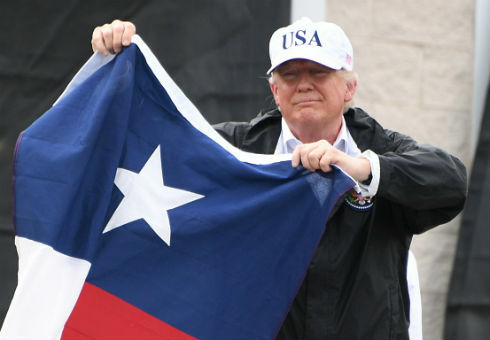 "The president and first lady witnessed the work of some of these groups first hand while visiting with hurricane survivors, first responders, volunteers, and federal, state, and local officials, and are proud to further assist the recovery efforts in Texas," the White House said in a statement. "Several of the following organizations were recommended, at the invitation of the president, by members of the White House Press Corps, and he would like to thank those who made recommendations for their attention to this important cause," the statement continued. "The president and first lady continue to pray for the people of Texas and Louisiana." This entry was posted in Issues and tagged Donald Trump, Hurricane Harvey, Louisiana, Melania Trump, Texas, White House. Bookmark the permalink.